Which census records are the best to search? All of them! Each census of an individual’s life provides valuable information. The trick is in learning to evaluate and analyze the data. You don’t know what you don’t know, so today I’ll be sharing ideas for how to use the censuses that you’ve already located. I’ll also share my favorite links for census research, and demystify the non-population schedules. 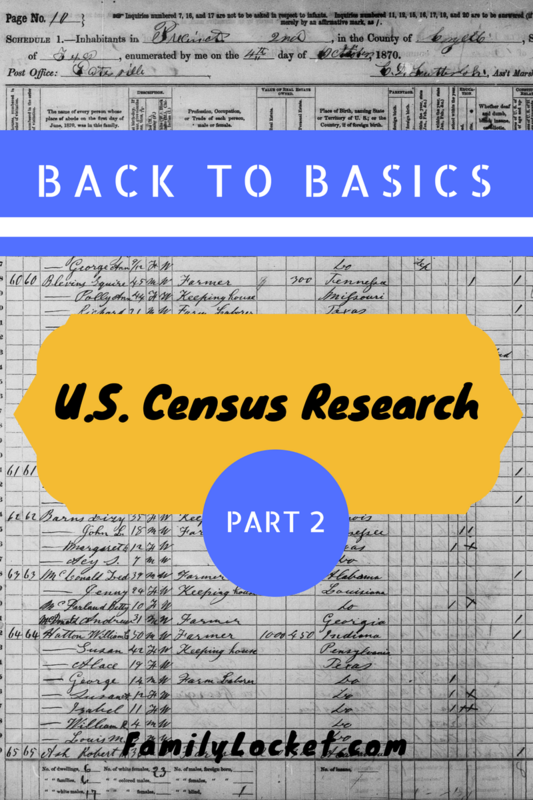 If you missed it, in Back to the Basics with U.S. Census Research – Part I you’ll learn why the census was taken, what information you can learn for each year, and census search tips. Four simple steps can help you gather all of the information on a census form and use that information to jump-start your research. 1- Make a complete abstraction of all of the census information. Don’t be tempted just to copy the names, ages, and birthplaces. Take note of occupations, land and property values, and all other data. I like to use a table in a Google Doc to list the information. As in any transcription or abstraction project, just the act of copying down the information helps you to process it. The example below describes the household of George W. Dillard. The 1850 census was relatively simple, just asking for gender, age, occupation, and birthplace. This was the first census to list all household members, so although no family relationships are stated, it does help to fill in the blanks of the family. -George is listed as 26 years older than Martha. Was this a 2nd marriage? -There are 6 years between Alonzo and Columbus Dillard and 6 years between Leonidas and Alonzo Dillard. Are there other children not listed on the census? -Alonzo was born in Georgia in 1835 and Leonidas was born in Alabama about 1841. Does this fit with what I know about the family’s migration? -George was 68 in 1850, was he alive when the 1860 census was taken? -If George was born about 1782, as estimated from his age in 1850, he probably married first between 1802 and 1812, either in Virginia or Georgia. -Martha was born about 1808, if her age is correct on the census. Her first marriage would be most likely after 1824. -George’s first wife probably died and he married Martha about 1825, probably in Georgia. -Columbus was born about 1829 and Alonzo about 1835, both in Georgia so George W. Dillard should be living in Georgia on the 1830 census. -The family moved to Alabama by 1841 where Leonidas and Zenora were born. 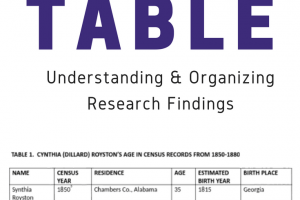 George W. Dillard could be in Alabama for the 1840 census. 4- Write down other records to search. What records might answer the questions that are raised from the census information? -Search marriage records of Georgia for the marriage of a Martha and George W. Dillard about 1824. -Search the 1860 census for the Dillard family. -Search the 1840, 1830, and 1820 census records for a George W. Dillard in Alabama or Georgia. -Search early Georgia marriage records for a possible first marriage of George W. Dillard. You might be surprised at the amount of information and clues to your research that you can gather from one census. Just think if you combine that with every census of your ancestor’s life. Population schedules are most commonly used because family historians are in the business of people. But what about other census schedules. What are they and can they help in your research? The federal government not only wanted to know about it’s citizens, it also wanted to gather information about who had died, who was a veteran, number of enslaved individuals in a household, any persons who had physical or mental limitations, and agriculture/manufacturing data for a community. Ancestry.com has the indexed collection with images at “U.S. Federal Census Mortality Schedules, 1850-1885.” It is definitely worth a try to see if any of your family is included on a mortality schedule. You’ll find information such as the month he died, cause of death, and number of days ill.
1890 Veterans Schedules: This one-time schedule was conducted to help Union veterans find compatriots to assist in the procurement of pensions and for the government to identify the extent of their future monetary obligations. Unfortunately nearly all of the schedules for the states of Alabama through Kansas and about half of Kentucky are missing. Check for your family members on the Ancestry database, “1890 Veterans’ Schedules” and the FamilySearch collection “United States Census of Union Veterans and Widows of the Civil War, 1890.” If your ancestor fought in the Confederacy, he may still be listed, just with his name crossed out. Prior to 1850, enslaved individuals in a household were listed after the free individuals. In 1850 and 1860, a different schedule was used and listed the residence and name of the slave owner, the number of slaves owned, age, gender, and color of each slave. If you’re doing African-American research, these schedules can give clues to a family, but no names are mentioned for the most part. FamilySearch has the 1850 Slave Schedules. Ancestry has the 1850 Slave Schedules and the 1860 Slave Schedules. 1880 was the only year the the federal government required a separate schedule for the following classes: insane, idiots, deaf-mutes, blind, paupers and indigent persons, homeless children, and prisoners. As offensive as those terms are today, that was the terminology used by our ancestors. Ancestry has the digitized and indexed collection, U.S. Federal census – 1880 Schedules of Defective, Dependent, and Delinquent Classes. The U.S. federal government wanted to know about the agriculture, manufacturing, industry, and social statistics in any given location, hence the non-population schedules. Ancestry hosts this collection and gives a very helpful explanation of what you will find in each type of census. If you’re lucky enough to have an ancestor listed, you might find out interesting details about his life. In the image below, my 3rd great grandfather, Thomas B. Royston is listed along with his land, livestock, and crops produced during the year ending June 1, 1860. As you’re viewing this type of census, make sure you view the next page of the census for the remainder of the information. I knew Thomas ran a large cotton plantation so it was helpful to compare his information with the neighbors. Atlas of Historical County Boundaries: hosted by The Newberry Library, this excellent website will help you understand the boundary changes in each United States county. Census Finder: This directory of free census records contains over 49,000 links to census records. Choose a state and see at a glance what state censuses, territorial censuses and any special censuses were taken to supplement the United States federal censuses. 1790-1840 Census : Birth Year Calculations: This very handy website does the math for you in figuring out the range for your ancestor’s birth year, based on the tick marks of those early censuses. Census research is never finished. You’ll return to those schedules over and over as new information about your family comes to light. My final tip – download the images and save them to your own computer files under your ancestor’s name. You’ll then be able to quickly and easily access them. Best of luck in all of your census research! ¹ 1850 U.S. Census, Macon County, Alabama, population schedule, 21st District, p. 272 (stamped), dwelling 1088, family 1096, George W. Dillard household; digital image, Ancestry (http://www.ancestry.com : accessed 10 March 2017); citing NARA microfilm publication M432, roll 9. ² 1860 U.S. Census, Chambers County, Alabama, agriculture schedule, Northern Division, Bethlehem P.O., p. 31 (penned), line 3, Thos B. Royston; digital image, Ancestry (https://www.ancestry.com : accessed 21 June 2017); citing NARA microfilm publication M279, roll 27. 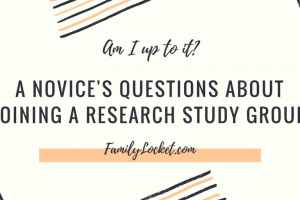 Do you want to take your genealogy research to the next level? 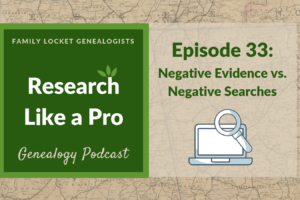 In our Research Like a Pro Study Group, learn how professional genealogists stay organized and make discoveries. You will meet twice a month via google hangouts, complete assignments, do peer reviews, and receive feedback from professional genealogist, Diana Elder AG®.